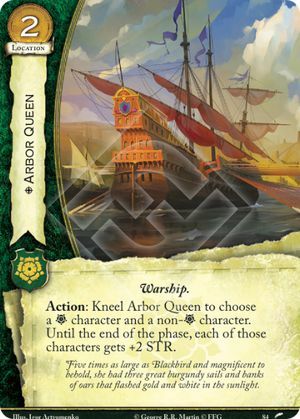 Action: Kneel Arbor Queen to choose a character and a non- character. Until the end of the phase, each of those characters gets +2 STR. Five times as large as Blackbird and magnificent to behold, she had three great burgundy sails and banks of oars that flashed gold and white in the sunlight.